The latest news out of the Lowell Police Department is the release of a much-anticipated internal investigation report that reviewed the actions of 7 police officers involved in the arrest of a man named Paul Aaron on March 7, 2018. It’s a long read and hard to follow so I’ll break it down for you. Full disclosure: I had no involvement in this case. Back in March of 2018 a joint federal and state law enforcement task force investigating drug distribution in northern MA and NH received a tip that a target of their investigation would be traveling to Lowell to deliver a kilogram of fentanyl to Mr. Aaron. Members of the task force requested assistance from the Lowell Police to surveil the transaction and several detectives from the Lowell Police Department’s Special Investigations Section (SIS) got involved. Mr. Aaron was arrested after officers witnessed what they believed was the meeting with the distributor and they secured a plastic bag that he had been carrying that contained a kilogram of powder. The federal investigation kept on going and Aaron became a Lowell Police arrest. SIS detectives went back to the station and prepared a police report about the arrest and applied for a warrant to search an apartment that they stated was Mr. Aaron’s residence. They found two firearms, ammunition, money and drugs in the apartment. At a later time Aaron was charged as part of a large drug conspiracy in federal court in New Hampshire and the state charges were dropped. Immediately after his arrest, a defense investigator working for the Committee for Public Counsel Services (the public defender’s office) secured surveillance footage from a nearby business that showed a dramatically different version of Aaron’s arrest than had been described in the police report and then repeated in the search warrant application. That surveillance video was passed on to the lawyer representing Aaron in his federal case in New Hampshire. In October of 2018 a New Hampshire State Trooper involved in the task force testified in federal court about the circumstances leading up to Aarons’s arrest in Lowell. After he was done, Aaron’s defense attorney shared the surveillance video with the Court and that’s when things got crazy. Two Lowell SIS Detectives who had been in NH federal court waiting to testify at the hearing were sent back to Lowell with some indication that things were awry. The Lowell Police were notified about concerns about the events that surrounding Aaron’s arrest which resulted in this inquiry. Aaron ultimately pled guilty to drug conspiracy charges in federal court but the items seized in Lowell were not counted towards calculating the drug weight attributable to him. In the Lowell Police report submitted by Detective Rafael Rivera, Aaron is said to have walked over to a taxi being driven by the target of the investigation and return holding a plastic shopping bag that he had not been carrying previously. The police used his acquisition of the plastic bag as justification to stop and seize him. According to the report, the same NH Trooper who testified in federal court (Francisco Vicente) approached him first right in front of the entrance to 193 Merrimack Street. As soon as Vicente announced that he was police Aaron resisted arrest and tried to flee into the building. 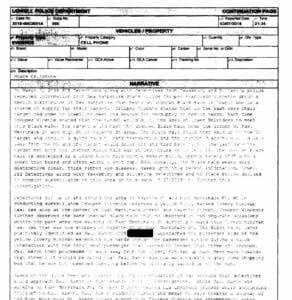 The police report gives a very detailed account of the actions taken by each approaching officer to apprehend Aaron and secure the drugs. 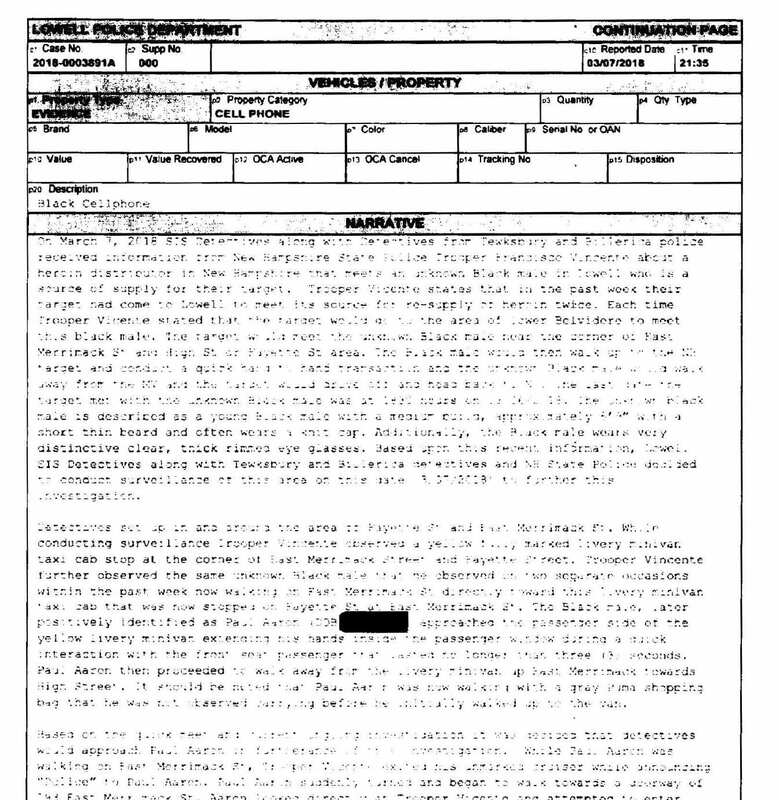 Information from this report was cut and pasted into an affidavit submitted to the Lowell District Court by Detective Nicholas Dokos to secure a search warrant for an apartment inside 193 Merrimack that the police maintained was Aaron’s residence. Aaron’s attempt to enter 193 Merrimack Street was used in the search warrant affidavit to connect him to the apartment that the police wanted to search. It was determined during the internal investigation that Rivera did not write the report that was submitted under his name. Lowell SIS Detective Daniel Lavoie, who was part of the joint task force, sat at Rivera’s computer and wrote a detailed report but it was decided that it would be submitted under Rivera’s name because Lavoie would have had to reveal his participation in the task force. The SIS detectives intentionally hid information from the Court in their arrest reports and search warrant application. Rivera had little background information about the night’s events and Lavoie wrote the narrative in a way that improperly suggested that Rivera had personal knowledge of the events. Rivera and Lavoie’s superiors signed off on the report and it became part of the record. Detective Nicholas Dokos prepared an affidavit in support of a search warrant that was submitted to the Lowell District Court. Dokos cut and pasted from the Rivera/Lavoie report without editing the narrative to attribute information that he learned from others to their sources. Lavoie had written the report in first person (e.g. “I saw Mr. Aaron walk towards….) so by not attributing information to other sources, Dokos gave the false impression in his affidavit of personally witnessing Mr. Aaron’s arrest and the circumstances leading up to it even though he was around the corner at the time that it happened. When Lavoie was confronted with inconsistencies between his report and what is shown on the surveillance video, he blamed the NH Trooper Vicente and suggested that he must have received incorrect information from him. The report was written as though the author (purportedly Rivera) had a clear view and memory of the details of Aaron’s arrest. Vicente declined to be interviewed in the Lowell Police Department’s investigation. Prosecutors, clerks, and judges put enormous faith in police reports. Criminal charges are issued, bail decisions are made, and guilty pleas are negotiated and entered based on what is written in these reports. Probation and parole supervision can be revoked based on what is written in police reports. What I’m trying to say is POLICE REPORTS ARE REALLY IMPORTANT! Defense lawyers know that some officers struggle with the truth but proving this is hard because often the only witnesses that could contradict the police are the accused and their family and friends. When a judge hears inconsistent versions of events between a police officer and a person facing charges (or their family member or friend) you had better believe that the judge sides with the police. But here we have surveillance video showing that what was written in the report was not true. Now let’s talk about the search warrant affidavit. Police prepare an affidavit and swear under oath to its truthfulness to an Assistant Clerk Magistrate who then reads the affidavit and issues the search warrant if it is deemed acceptable. When I find myself in the Lowell District Court’s clerk office I routinely see officers holds up their right hand and swear what they wrote is true. The clerk then reads the affidavit and if it seems to establish probable cause to search, it will be issued; if evidence of a crime is found upon the execution of the warrant and someone is charged, the defense lawyer can then argue that the warrant was issued improperly by filing a motion to suppress. In this case, Dokos swore to the truthfulness of everything that he cut and pasted in his affidavit even though the affidavit contains events that he was in no position to have witnessed. When challenging whether a search warrant was improperly issued by the court, the judge reviews what is written in the affidavit alone with no witness testimony. This is called the “Four Corners Doctrine” – the judge looks within the four corners of the page(s) of the affidavit. Like police reports, search warrant affidavits are believed to be true unless proven otherwise. Witnesses only get called for hearings challenging search warrants when the defendant makes a showing that false or misleading information was included in a sworn search warrant affidavit. The Board of Inquiry panel conducting the internal investigation ultimately determined that 5 officers were in violation of the Department’s Rules and Regulations by committing prohibited conduct. 2 officers were absolved of wrongdoing. Lavoie was found to have committed the offense of False Information of Records by submitting a report he had written under Rivera’s name which was done intentionally to hide his involvement from the Court in an ongoing federal investigation. The report he submitted contained inaccurate information. The Panel determined that the evidence did not support a finding that he intentionally included false information because Vicente declined to be interviewed for the investigation. Lavoie was also found to have displayed Gross Incompetence in his preparation of the police report and to have committed Conduct Unbecoming to an Officer. Rivera allowed a report written by another detective to be submitted under his name for approval to a supervisor and to the court. As a result, he was found responsible for False Information of Records and displayed Unsatisfactory Performance in his duties and Conduct Unbecoming to an Officer. The Panel found that Dokos used portions of the Rivera/Lavoie report in his affidavit unaware that they contained incorrect information. He was faulted for failing to edit the information in his affidavit to show that the information came from other sources and was not based on personal knowledge. He was also faulted for failing to return the warrant to the Court on time once it was executed and failing to keep a proper case file on the Aaron investigation. Dokos was found responsible for False Information of Records, Unsatisfactory Performance of his duties, and Conduct Unbecoming to an Officer. Matthew Penrose was the Officer in Charge of the SIS Unit and was faulted for failing to properly supervise his subordinates. He was found to have displayed Gross Incompetence and Conduct Unbecoming of an Officer. Penrose was a lieutenant at the time of the Aaron arrest and was promoted to Captain prior to the completion of this investigation. Daniel Desmarais was found to have displayed Unsatisfactory Performance in his duties and Conduct Unbecoming of an Officer in his capacity as the supervisor of the SIS unit. In particular, he did not review Dokos’s affidavit properly and had he done so he would have noticed that Dokos attributed information from the Rivera/Lavoie report as his own personal knowledge. The Panel noted that when Desmarais learned from them that Lavoie had written the report that was filed under Rivera’s name, he did not see that as problematic as long as the information was accurate. The Panel disagreed and stated that both the supervisor and the court needs to know who wrote the report. The Board of Inquiry found that two other SIS detectives, David Lally and David Kew, who were involved in the Aaron investigation did not violate any of the Department’s Rules and Regulations. So what happens now? I don’t know. The internal report only indicates which of the Department’s Rules and Regulations have been violated by the charged officers and does not make recommendation for consequences to the officers. For guidance we can look to the Lowell Police Department’s handling of another officer involved in producing false reports and incompetence in performance of his duties. In 2012, Thomas Lafferty, then a detective with the SIS Unit, was found to have been using an informant who was planting evidence to facilitate charges against unsuspecting individuals. The issue came to light when the informant went to the Massachusetts State Police and bragged that he was working as an informant and planting drugs and offered to do the same service for them. The State Police took appropriate action and declined to work with this informant and notified the Middlesex District Attorney’s Office. Middlesex decided to do an external review brought in a high ranking ADA from the Essex County District Attorney’s Office to conduct the investigation. Ultimately Lafferty was cleared of wrongdoing by the investigator which was weird because Lafferty authored multiple reports (and I also believed testified before the grand jury) about personally observing these wrongfully charged individuals retrieving drugs from their gas cap compartments. He made these false statements to make the cases against these individuals seem strong and to avoid revealing to the court that he was working with a confidential informant. The charges against the individuals whose cases were built on this informant’s tactics were dropped and three of them sued the City of Lowell. The City settled with the plaintiffs agreeing to pay $750,000 in 2017. Lafferty remains employed with the Lowell Police Department as a patrol officer. The more pressing issue to me is how the Middlesex District Attorney’s Office and other prosecuting agencies will handle unrelated cases investigated by the officers implicated in the Aaron investigation. Will they view the transgressions in the Aaron investigation a one time infraction that does not cast doubt on other investigations? I don’t view this as a closed matter and will certainly be raising the issue in other cases involving this group of officers. Stay tuned. → Motion for New Trial Allowed!